Isiah Factor | The Insite » BATON ROUGE IS NOT A CITY FOR EVACUEES! BATON ROUGE IS NOT A CITY FOR EVACUEES! 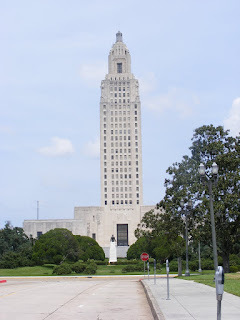 August 31, 2008 | Posted in Uncategorized | Comments Off on BATON ROUGE IS NOT A CITY FOR EVACUEES! WHERE NEW ORLEANS RESIDENTS SHOULD NOT GO! THOUSANDS OF NEW ORLEANS RESIDENTS ARE LANDING IN A CITY WHERE THEY SHOULDN’T BE…THAT’S BATON ROUGE. THE MAYOR OF THE CITY SAYS IT’S NOT DESIGNATED AS A RESIDENTIAL SHELTER LOCATION. HOWEVER THOUSANDS OF EVACUEES FLEEING GUSTAV HAVE GONE THERE. MAYOR KIP HOLDEN SAYS BATON ROUGE IS THE COMMAND CENTER AND SHELTER LOCATION FOR FIRST RESPONDERS FROM THE AREAS THAT COULD BE HIT BY THE STORM SYSTEM. BUT BACK IN HIS CITY THEY’RE ALREADY FEELING THE EFFECTS. THERE ARE SOME GAS STATIONS THAT ARE RUNNING OUT OF FUEL, STORES LOW ON FOOD AND HOTELS ARE AT THE MAXIMUM OCCUPANCY. FOR THOSE WHO ARE WONDERING JUST BECAUSE BATON ROUGE IS NOT A SHELTERING CITY DOESN’T MEAN EVACUEES CAN’T COME HERE. IT MEANS IF THEY COME HERE THEY’RE ON THEIR OWN. THERE ARE NO RED CROSS OR OTHER EMERGENCY HELP SERVICES SET UP FOR HIM. BUT THEY ARE FREE TO GET THEIR OWN HOTEL OR FIND FAMILY MEMBERS OR FRIENDS TO BUNK WITH FOR THE DURATION OF THE STORM.